Preface. Solution Focused Brief Coaching. Children. Adolescents. Parents. Groupwork. In the School. In Different Settings. Materials. Harvey Ratner is a co-founder of BRIEF, established in 1989 as a London-based independent training, coaching and therapy agency for the development of Solution Focused practice. He and his colleagues Evan George and Chris Iveson have taught the approach to over 70,000 people around the world. They are the authors of Solution Focused Brief Therapy: 100 Key Points and Techniques and Brief Coaching: A Solution Focused Approach (Routledge). He works with young people and families in schools and at BRIEF. Denise Yusuf, with a background in social work and management, is a freelance coach and supervisor who has spent most of her career working with children, young people and families. She works in a number of schools running coaching programmes for primary and secondary school pupils, as well as coaching children and young people from youth organisations and charities across London, and in her private practice. ‘As a systemic therapist who uses Solution Focused therapy with clients of all ages, I am thrilled to see a book that reaches all populations of clients with such elegance and efficiency. This book will provide a marvelous tool for practitioners working with children, adolescents, parents, teachers and groups in schools and agencies. Steve de Shazer's idea of "there is no such thing as resistance" is proven here in this book, which contains enough case studies and examples to free even the most reluctant client from resistance into cooperation and then success. What a terrific gift to the field of coaching, counseling and therapy.’ - Linda Metcalf, Director of Graduate Programs, Texas Wesleyan University, Fort Worth, Texas and author of Counseling Toward Solutions. 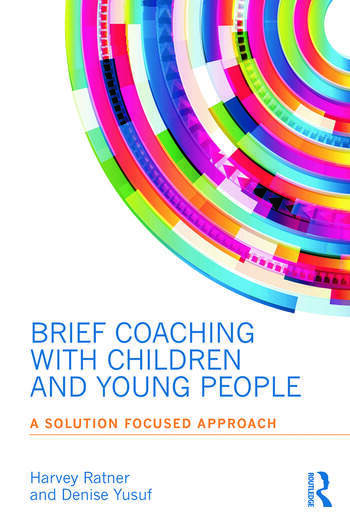 ‘Coaching is now being used successfully with a range of clients, children and young people being but one. Coaching not only helps deal with the issues presented but is also psychoeducative. This meaning that it helps individuals develop new ways of approaching life in general. Children and young people learn fast and the learnings gained at this age lead to more fulfilling lives. This is a book that anyone working with such an age group would benefit from.’ - Gladeana McMahon, FAC, FRSA, FBACP, FIMS, FISMA. Chair Emeritus, Association for Coaching UK and leading Transformational and Behavioural Change coach.